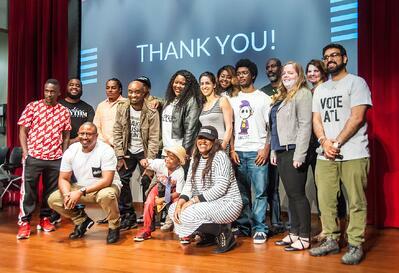 The 2018 A3C Action Accelerator Finalists will be pitching for $10,000. 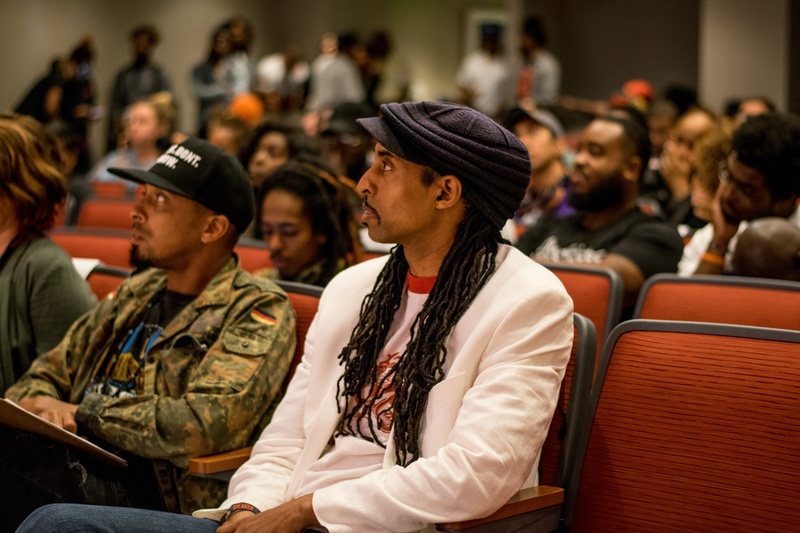 The Action Accelerator aims to find, develop, and invest in new, innovative ideas that use art, music and hip-hop culture to advance social justice in underserved communities. The creative community has been the heart and soul of social justice movements throughout history. Creatives have brought the struggle for justice and change to life through the arts, and we are proud to honor and carry on their legacy. A partnership with the Center for Civic Innovation, a civic venture fund that invests in community-driven ideas. 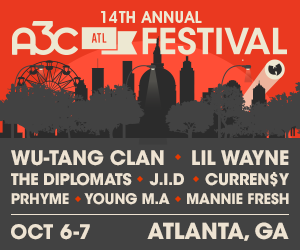 “I'm most excited to meet and feed off of the energy from the other entrepreneurs at the A3C Action Summit. It's always refreshing to see others fighting the same battles to help out our community.” - Marcus Blackwell, Jr. Girls Cut Film too is an initiative to train and equip teen girls with the skills needed to be competitive in the film production industry. The program is a Summer Film Institute for Girls that will expose them to various fields within the film industry such as: producer, director, script writer, camera operator and more! We will implement the Teen Poetry Initiative within a minimum of two of the nineteen Birmingham Public library neighborhood branches and at Real Life Poets community arts hub in the East Lake community. This allows direct access for middle and high school age youth in Birmingham City Schools, which is 95% African-American. Arts activist and teaching artist training will be facilitated at the Real Life Poets community arts hub which is directly situated in one of Birmingham’s most underserved communities. This project would be implemented in New York City at Rikers Island jail. This project will allow for youth within four facilities at Rikers to write around specific themes and be featured in monthly performances during their incarceration. Some of the most genius writers, poets, MCs, etc are incarcerated but lack outlets to express themselves while being refueled and supported by other artists. Creative mentorship and art advocacy not only allows space for expression but is also a springboard to guide young people into other needed discussions and decisions. The goals and mission of Media Rhythm Institute to encourage, promote entrepreneurial thinking and empower youth to expand their knowledge of the media industry through research and hands-on documentary projects. Our goal is to inspire young people to pursue a career in the media profession and also improve their quality of life by offering encouragement and exposure to positive opportunities. Thanks to our sponsors Mailchimp and ChooseATL! We received over 140 applications from more than 25 states. Armed Services Arts Partnership - ASAP (Arlington, VA) empowers veterans and their communities with purpose and healing to have a voice in their communities through a stand-up comedy boot camp. Creative Core (Washington, DC) offers a fellowship program for youth who are in school, have dropped out, or are court-involved to prepare and place them as support staff in creative businesses with a focus in the arts, music, and hip-hop industries. [People's Choice] Girls Make Beats (Miami Lakes, FL) teaches young girls music production, DJing, and audio engineering through an after school program at a state of the art recording studio. 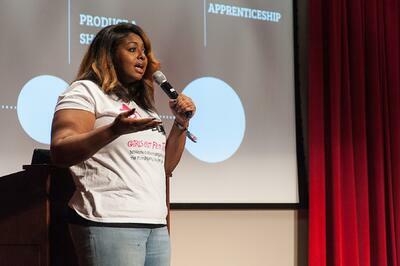 They mentor and nurture girls to have their voice heard, and create future career opportunities for participants. Notes for Notes (Atlanta, GA) equips, staffs, and runs free recording studios, providing music education and mentorship for youth for 160 members in a censor-free environment. re:Imagine/ATL (Atlanta, GA) is equipping media’s next generation of storytellers, working with teens of different backgrounds across Atlanta to collaborate on video and music productions in and out of school. [Runner Up] Shooting Without Bullets (Cleveland, OH) is a revolutionary youth advocacy and fine arts education program that focuses on identity development in black teens in Cleveland through photovoice, expressive arts healing, and open dialogue. [Winner] The Village of Arts and Humanities (Philadelphia, PA) offers a paid internship and media-centered makerspace that positions youth as experts on issues impacting them, while providing a platform to process and amplify their narratives, experiences, and voices. 303 Community Coalition, INC. (Atlanta, GA) Create a short film about gentrification vs. resident upgrading, using narratives from residents containing all five elements of hip-hop. [Winner] Chop Art (Atlanta, GA) Empower homeless youth through art by providing a two week arts summer camp focused on the holistic immersion of music, theater and dance. Media In Neighborhoods Group (Philadelphia, PA) Prisoners, police, prosecutors, judges, at-risk youth create short documentaries about each other to increase humanity and understanding. ourtime.org (Washington, DC) One of the nation’s largest non-profit organizations committed to increasing the voter participation of young Americans. Poem Over Pistol Program (Atlanta, GA) The P.O.P Program is a Life Skills Program that teaches Youth how to redirect their negative emotions into a rap, poem, song or short story. The Center for Civic Innovation (CCI) focuses on improving the efficiency of public organizations and increasing civic participation. 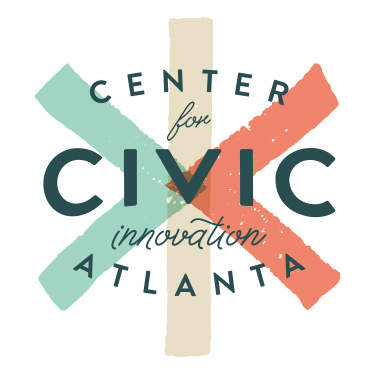 CCI is the City's Lab aiming to push Atlanta to be a smart, equitable, and engaged city by investing in community-driven ideas, supporting social enterprises, and engaging people in dialogue and action. CCI hosts programs for community based social entrepreneurs at all stages, but they focus their investments on early stage, untested projects. The Hip Hop Caucus (HHC) is a national, non-profit and non-partisan organization that connects the Hip Hop community to the civic process to build power and create positive change. HHC hopes to establish the culture and practice of voting as part of a desired civic lifestyle as well as empower and train leaders and volunteers from our communities to be strategic leaders, messengers, and spokespeople for issues critical to equality, justice, and opportunity.